Hailing from a higher dimensional universe known as Novo, Yaha-kui zaShunina is able to transfer information between Novo and Shindou's universe through a cube called Kado. Despite having these unfathomable abilities, he does not appear hostile. Instead, he announces that he has come to this world with only one intention: to "advance" humanity—starting with Japan. My Opinion: Absolutely Amazing. Really. 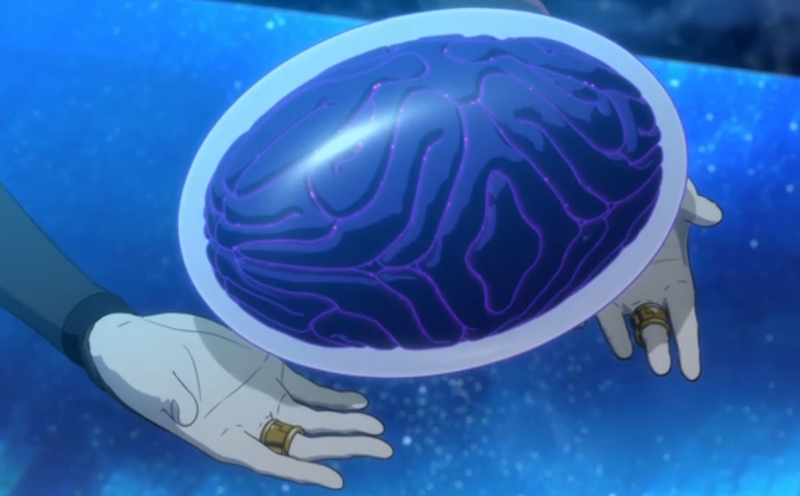 What better solution can you come up with for 3D CGI in 2D animation looking so utterly alien and immersion breaking, than to Literally make it something fundamentally alien to the rest of the show in every way? It's Brilliant, and that's not the only amazing part of the show. I dare say we may be looking at the to-date utter peak of the Fantastical made Realistic. That bomb drop at the end of episode 6 was just...Figurative and literal Minds Blown. Aside from the general impression and theme being spot on thanks to the 3D CGI, the characters and plot of the show are amazing as well. I was so utterly invested in this show by the second episode but...I wonder how everyone else will take it? I always have a weak spot for the realistically fantastical, but there's a lot of people out there that enjoy simple off-the-cuff ridiculous and fun styled fantasy, like most entries from the Shounen Genre. Having said that, this show is taking us on a wild ride of what would happen if an 'Alien' showed up, and was expressing an explicit intention to be beneficial to humanity. Pointedly, how several segments of humanity would outright resist change, because that's what we naturally do. The show includes a large segment of Human Politics. Give the show until at least the resolution of the 'Wam' arc. I believe that will give you a succinct summary of everything you may expect and encounter in the show, because I sense a pattern. Introduce problem, Debate over solution, Have the 'ah-ha!' moment, and then gently hide the answer just long enough to give the audience a chance to come up with their own ideas, and see if they had the same one. I enjoy that, personally. I give this show a huge Recommendation. It's very thought provoking, and I like that.